Technically this is not an Age of Extinction toy, but is being reissued because Grimlock is in the movie, so I’m including it in my AOE blogs. 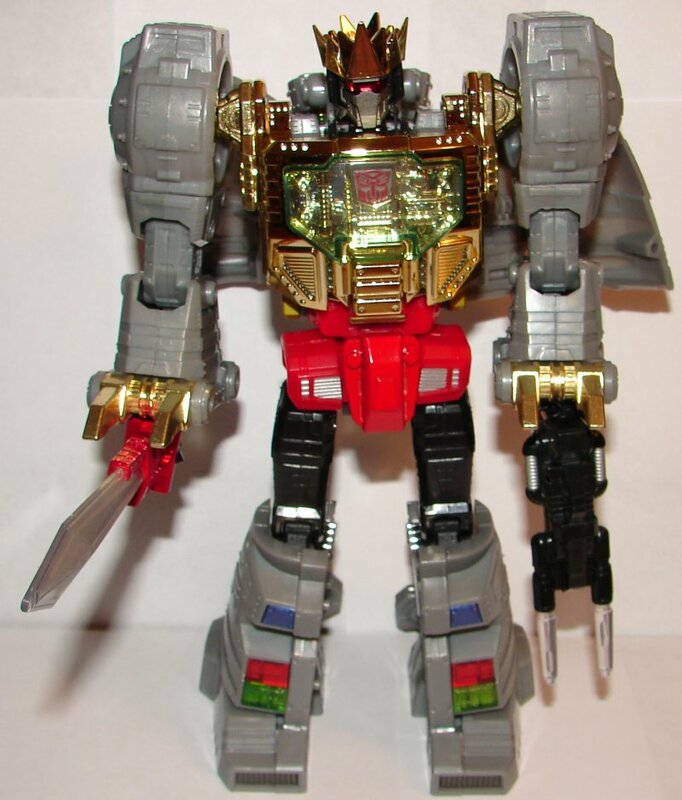 Masterpiece Grimlock has been out for a long time, so I’m not going to bother with a detailed review of the mold. Suffice it to say it’s awesome, probably among the top ten Transformers of all time. 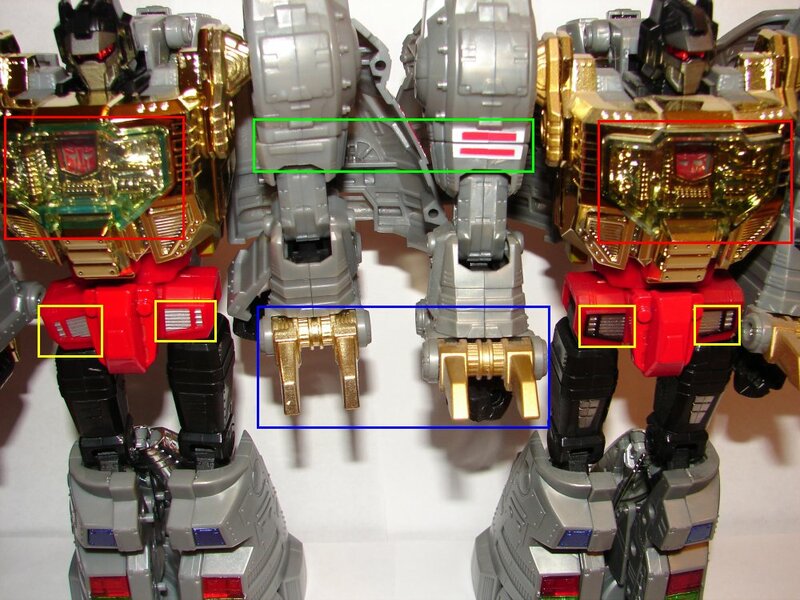 This one is different from the last Toys R Us Exclusive Masterpiece Grimlock, so I’m going to highlight the changes. The new version is on the left in all photos. It’s hard to tell from the photo, but the new sword on the left is red while the first sword on the right is more orange. Couldn’t get a great picture of it, not sure why the old one of them kept coming out black. In the green box above, you can see that the silver paint on the gun is brighter on the new version and duller on the old one. Also, the new one seems to be of lesser quality. 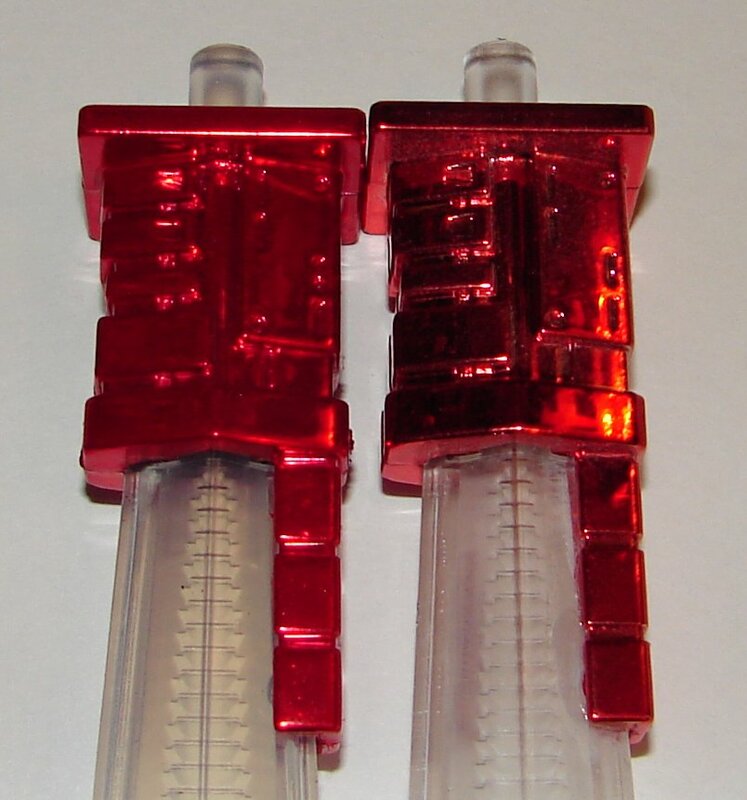 There are air bubbles in the translucent plastic parts on the new one as seen in the red boxes, but none on the old one. In the green box above, you can see the new version does not have the red and white apps on the arm. 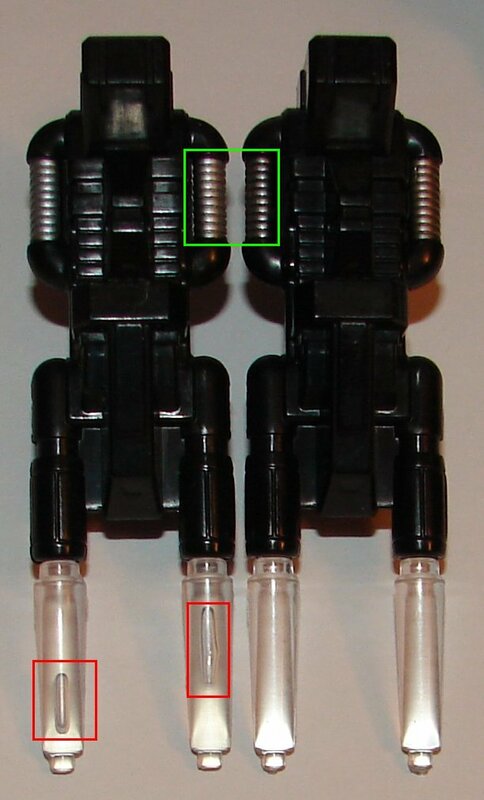 In the red box above, the newer one has a greenish tint on the translucent plastic, while the original was more a smoky gray. In the blue box above, you can see much shinier gold paint on his die cast claws on the new one. In the yellow box above, the silver areas are surrounded with black paint on the original, but this is left off the new one. Also, it’s not specifically noted since the chrome is so hard to photograph, but it looks to me like the new one is slightly lighter gold chrome than the original. It’s really hard tot ell though. 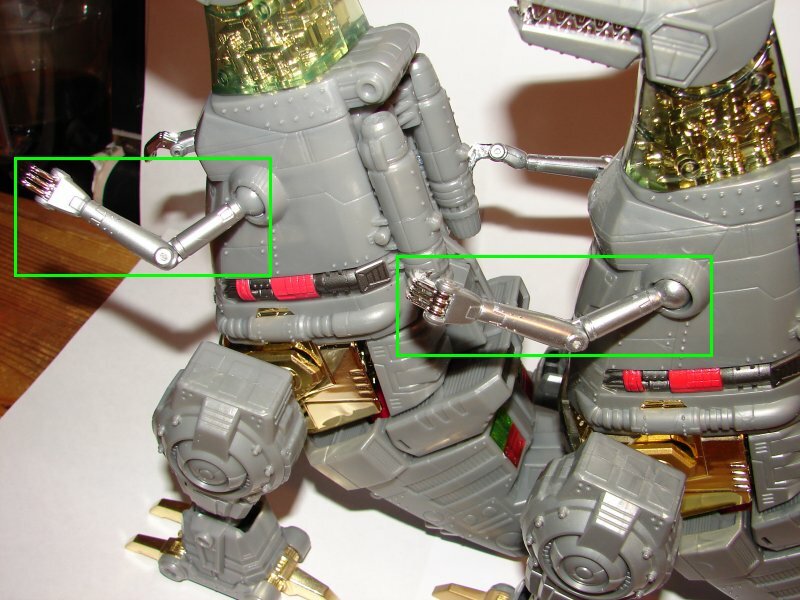 In the green box above, the original version has shiner silver paint on his entire arm. 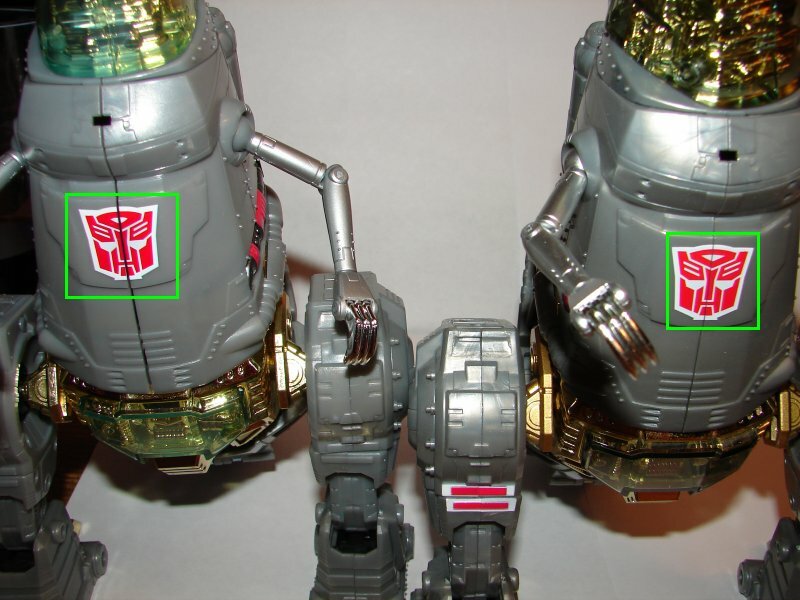 The newer one is less shiny and the ball in the socket is not painted. Lastly, it doesn’t photograph very well, but the Autobot logo on the newer one is slightly darker than the original version. 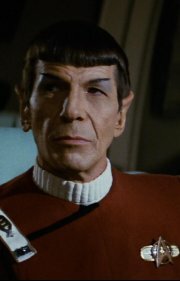 That’s all I could detect. As to which is better, I kind of like the green tinted clear plastic, but the differences are negligible. Overall: You can never have too many versions of this toy, but they did bump the price up from $59.99 a few years ago to $79.99 now. This entry was posted in Toy Reviews, Toys and tagged Age of Extinction, AOE, Grimlock, Masterpiece, Masterpiece Grimlock, MP-03, MP-3, Toys, Transformers, Transformers: Age of Extinction. Bookmark the permalink.